This week's VIew is coming to you from Lisa of The Golden Spoons. Lisa is someone I met through lots of blog hopping. We are also in a blogging group on Facebook. The "golden spoons" are her three daughters, and she talks here about having to force herself to not be too overprotective of them. We have lots of wooded areas around our house. 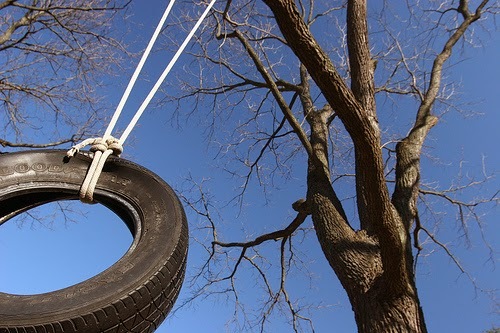 In one spot , down in the woods, my father in law made a tire swing for my three girls. With what can only be described a grandpa heroics (and a little bit of luck), he threw a rope around a very high, sturdy branch and tied an old tire to the end of the loop. My girls love it. A couple years ago, however, I was not so sure. You see, she is not exactly the most coordinated child and was, in fact, rather accident prone when she was younger. The idea of her playing a semi-contact sport like soccer was very scary to me. I was certain she would get hurt or, even worse, be laughed at or ridiculed. She continued to ask and, eventually I gave in and sign her up. Sometimes, as parents, we have to be more like our children - unafraid to swing way out over the cliff. We have to let go and maybe even give them a push. We have to trust that the branch is strong and that the rope will hold. We have to have faith that the risk is worth the outcome. Sometimes, we may even have to be a soft place for them to fall. But, we can't let the "what if's" paralyze us. "There are two precious gifts we can give our children. One is roots; the other is wings." I don't think I've ever been overprotective. At least not to my kids' faces. I let them do things, tell them to have fun, while inside I'm worrying. and then I feel like I'm probably doing the right thing when I let them go.